It's not the first place that comes to mind when you hear the words "clean water," but Brooklyn drinks incredible pure tap water that's carried by aqueducts connected to deep, cold reservoirs high in the Catskill Mountains. Foodies insist that this rarefied H2O is what gives certain New York staples, like pizza crust and bagels, their unique flavor. And that's why the Original Brooklyn Water Bagel Co. --a Delray Beach, Fla., quick-serve restaurant that began franchising in 2009--uses a 14-stage water treatment system that allows franchisees anywhere in the country to "Brooklynize" their water. That specially formulated H2O gives a Brooklyn tang to the coffee, soup, Coca-Cola and the store's 18 varieties of bagels. Larry King isn't the first person you'd think of when you hear "franchisee," but the Brooklyn native and bagel connoisseur jumped at the chance to become involved with the company, which is planning a major national rollout over the next year. 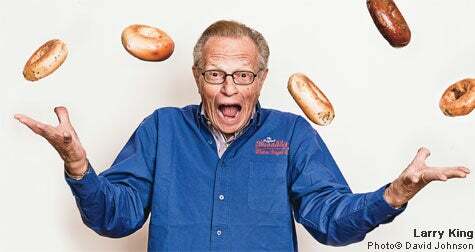 The CNN broadcasting legend, who is set to retire from his long running-show Larry King Live in November, recently inked a deal to promote Original Brooklyn Water Bagel, run its Beverly Hills location and serve as area developer for Los Angeles. We tugged on his suspenders in between interviews to ask him why he's getting into the bagel biz. You, bagels--how did this happen? A good friend of mine, Sid Young, we've been friends since high school, met these two guys, Steve Fassberg and Scott Harris, and he said they're fascinating and they're starting a whole franchise operation. So I met the guys and I had a taste of the product. They wanted me to be their spokesman, and in turn, I'd get a lot of stock and I'd be one of the principal owners of the store in Beverly Hills. We signed the deal. Is this your retirement hobby? I'll still do four specials a year for CNN, some sports and maybe some radio with Ryan Seacrest. I wouldn't say the bagel company will be my primary interest, but it would be a major interest because there's a chance it could be very, very rewarding. I have a cardiac foundation, and a lot of money I would make through this would go to that. Have you ever been a franchisee? I'm a broadcaster. I like being on the air, I like describing things, I like asking questions. I'm a curious guy, and I've always had an interest in franchising, how it works. I knew the guys who were with McDonald's, the Holiday Inn people and Burger King. I knew them pretty well, the guys who started that. Why not just lie on the beach? I'm 76, going to be 77, years old. I'm a young 76. I've gone through heart surgery, I have two young children, 11 and 10, and I want to be around to see them grow up. Actually, the money I make from this will be for the cardiac foundation and for their future. We've heard you're a health nut. Is this a healthful restaurant? Well, first off, the water's purer, and they have a scoop machine where you can scoop out the center of the bagel and just leave the shell, so you can cut a lot of calories. The bagel is not a nonfat product, but it's not an unhealthy product if you eat it right. Just scooping out a little flour and using lowfat or nonfat cream cheese, I'd call that a healthy breakfast.